UK schools are letting down business by producing too few scientists, the Confederation of British Industry says. Director-general Richard Lambert said bosses had "serious anxieties" and that more children needed to be allowed to study three science subjects at GCSE. Alan Wood, UK chief executive of technology firm Siemens, said most 16-year-olds' knowledge was "dire". 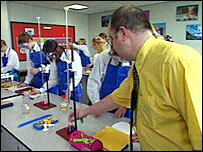 The government said it was working to improve science teaching to make it "a more attractive option" for pupils. The CBI said the current system, under which most pupils study for a "combined science" double GCSE - rather than chemistry, physics and biology separately - meant the curriculum had been "stripped down". Even universities had to offer remedial classes to science students to help fill gaps in their knowledge, it added. The CBI said the number of A-level students taking physics had fallen 56% in 20 years. In chemistry the decline was 37%. Mr Lambert said: "Employers are increasingly worried about the long-term decline in numbers studying A-level physics, chemistry and maths, and the knock-on effect on these subjects, and engineering, at university. "They see, at first hand, the young people who leave school and university looking for a job, and compare them to what they need - and increasingly are looking overseas for graduates." China, India, Brazil and eastern European countries were producing hundreds of thousands of scientists and engineers every year, he added. Mr Lambert said: "This is not a criticism of young people - they work hard to achieve the best possible grades in the system provided. "But it is clear we need more specialised teachers to share their enthusiasm for science and fire the imaginations of pupils, and to persuade them to study the core individual disciplines to high levels. "We must smash the stereotypes that surround science and rebrand it as desirable and exciting; a gateway to some fantastic career opportunities. "But the UK risks being knocked off its perch as a world-leader in science, engineering and technology. We cannot afford for this to happen." Mr Lambert said the government had to set "more challenging" targets for getting people to study science. Universities had to receive extra funding to offer more science degrees, he added. Schools Minister Jim Knight said: "Increasing the number of scientists is a priority for this government and we are already making significant progress on delivering the actions being called for by the CBI." The number of science graduates had increased since 1997, as had spending on teaching physics and chemistry in schools, he added. Mr Knight said: "We have been working across government with employers, schools and experts in the field to both improve the quality of science teaching and make science a more attractive option. "It is this joint working that will ensure we deliver the scientists of the future."